The only London hurler to ever get nominated for a senior All-Star award has passed away in the capital at the age of 80. Mick Butler, of the Fr Murphy’s club, was the goalkeeper for the 1971 London team who reached an All- Ireland Senior semi-final against Kilkenny in Croke Park. The Rathnure, Co. Wexford man, whose home club meant he played with the famous Rackard brothers, was originally with the Cu Chullains club before he joined the Murphy’s. And from there he remained a constant presence between the goalposts, playing with the team up until his early 60s. Fellow clubman and Wexford native Tommy Harrell said: “He was a very extremely dedicated club man, and even with all of the great goalkeepers that this county has seen; Liam Shanahan, Billy Barnaville and Eamon Walsh, I think he was definitely the best, on consistency alone. 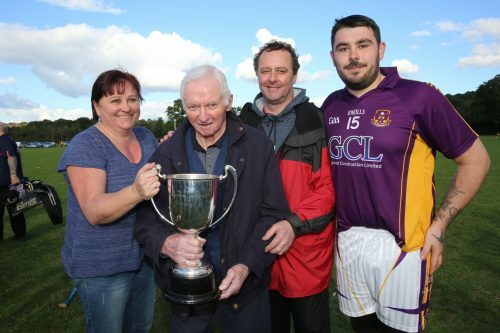 Mick, who celebrated his 80th birthday in December last year, passed his passion for hurling onto his children. His sons Michael (RIP) and John were involved at underage and his daughters Breda and Jean played with the camogie team. He also got to watch his grandson Christopher Weller claim a county title last year. Christopher started at corner-forward in the IHC final against Brothers Pearse last October, in a match that the Murphy’s fought back to win late on.